Portland’s protests are bringing light to racially biased policing. Can Protesting Trump Inspire White Awareness About Racially Biased Policing? Portland, Oregon, at once a liberal epitome and the whitest city in America, might find out. 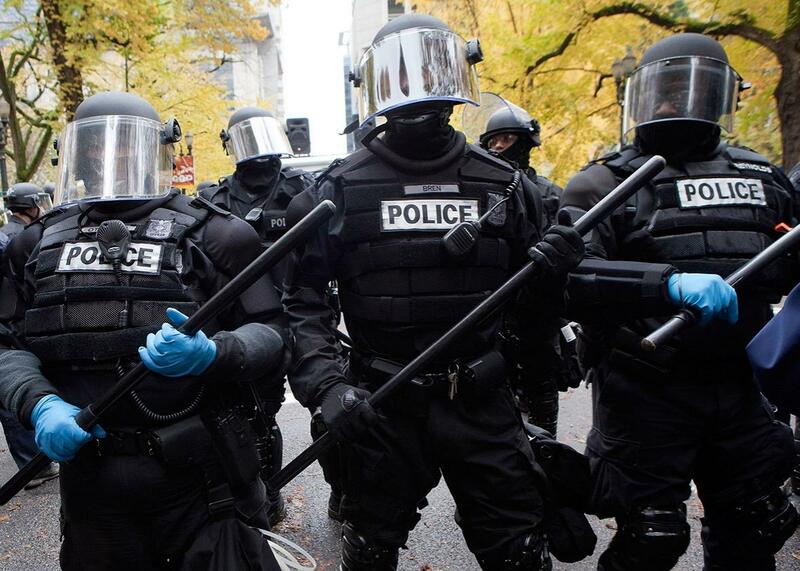 Police in riot gear with batons stand their ground near the Occupy Portland encampment on Nov. 13, 2011, in Portland, Oregon. Of all the byproducts of the Trump presidency, the increased drive to organize, agitate, and take to the streets is one of the brighter consequences. Since Nov. 9, many have joined in protest for the Women’s March, the March for Science, and to challenge the travel ban. Notoriously liberal Portland, Oregon, is no exception. Portland also happens to be America’s whitest city—72 percent of residents are white and just 6.3 percent are black. As protesters assemble, some for the first time, white Portland is finally getting a glimpse of what many black residents have known for years: Racially biased policing exists even in liberal havens like their own city. Many black Portlanders have lived through brutish policing for decades—and have tried to fight against it—but only recently have white protesters opened their eyes to the problem. Police have used excessively militarized methods against protesters of all colors: Rubber bullets, tear gas, and flash bangs deployed on Presidents Day, May Day, and other postelection protests have brought this into sharp relief. Though people of color make up a small portion of Portland’s population, they are vastly overrepresented in every part of Multnomah County’s criminal justice system. Black people make up just under 6 percent of the county’s population, but they represent 27 percent of the county jail population. They are arrested, fined, and ticketed at higher rates than whites across the board. Groups led by people of color, like Portland’s Albina Ministerial Alliance, have been trying for years to bring greater oversight to the city’s police department and its fraught relationship with the black community. In 2011, the AMA called on the U.S. Department of Justice to investigate the use of force by police against black Portlanders following the killing of two black men by police. When the DOJ investigated, it found a pattern and practice of excessive use of force against the mentally ill. The agency, though, declined to focus on the racially disparate practices of the department, and the resulting settlement agreement between the city and the DOJ didn’t address race. The litany of changes negotiated in the settlement, approved in August 2014, include the mandate to train crisis intervention officers to handle encounters with the mentally ill, restrictions on the use of Tasers, and an overhaul of the department’s use of force policy. Meanwhile, violence has continued. On Wednesday night, a transit police officer shot and killed Terrell Kyreem Johnson—a 24-year-old whose family members say was struggling with mental health issues stemming from drug addiction. (Court records from a bicycle theft arrest identify Johnson as black, according to the AP.) Police allege Johnson was wielding a utility knife and harassing passengers at a transit station. It was the third shooting of a civilian by Portland police this year, and the second that involved a victim apparently struggling with mental illness—a glaring indictment of the department’s failure to adjust to the demands of the settlement agreement. Despite Portland’s progressive reputation, Oregon has a history of state-sanctioned white supremacy. The Oregon Constitution, approved in 1857, forbade blacks from owning land or even living in the state unless they were slaves. Oregon didn’t ratify the 14th Amendment until 1973, more than a century after the Civil War ended. The state was also home to one of the nation’s largest concentrations of Ku Klux Klan members in the 1920s, boasting 9,000 in Portland alone. As recently as 2015, Klan recruitment flyers were distributed to homes throughout Gresham, Oregon, just east of Portland. In 2010, Capt. Mark Kruger was briefly suspended for erecting a public tribute to five Nazi soldiers in a Portland park. He subsequently sued the department and was awarded $5,000 in back pay by the city and had his disciplinary record expunged. He still works for the Portland police today. In 2010, Officer Ronald Frashour fatally shot an unarmed black man in the back with an AR-15 rifle as he ran toward a car. Five years later, Frashour was rehired and became one of the city’s highest-paid public employees. Portland’s new mayor, Ted Wheeler, ran on a campaign that promised transparency and change. His police reform platform was ambitious but vague: He vowed to “take further steps to end racial profiling,” to “actively demilitarize the police force,” and to “implement police body-mounted cameras and transparency policy with public input,” among other goals. Unfortunately, Portland’s union renegotiated its contract right before Wheeler took office, behind closed doors and without opportunity for public input. Protesters argued that it was intentionally rushed through to limit the mayor’s input. The contract is good for the next four years. It will likely limit Wheeler’s ability to make good on these promises, and he has yet to push back on it. In late March, Portland’s Resistance, the coalition of activists that formed after Trump’s election, published a list of demands for change in the local criminal justice system, seven of which address the police department. They include focusing policing resources on fighting violent crime rather than low-level offenses, increasing transparency in all police encounters, abolishing the city’s controversial gang database, and ending excessive use of force by police at protests. The group has received feedback from just one city council member, on only one section of the proposal, according to Gregory McKelvey, the organization’s founder. “We did a lot of the work for them, and we think we’ve made it easy to at least start picking and choosing things that could work,” said McKelvey.